I think was in about 5th grade when I started playing this board game with my friends. My memory of it is a little fuzzy, and there seems to be relatively little information about it on these here internets, but it doesn't take too much remembering for me to know that this game didn't exactly teach me any progressive ideas about gender or sexuality. From what I remember, the game was set up like Truth or Dare, with a spinner that landed on a question you had to answer or a challenge you had to live up to, and if you refused to answer a question or fulfill a challenge, your punishment was to wear a bright red zit sticker on your face -- because nothing is more embarrassing to pre-teens and teens than acne! 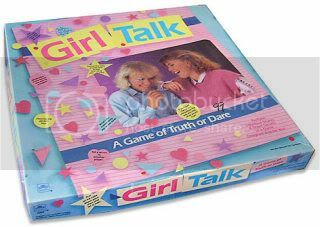 Except for those zit stickers, everything in the game was pink, and the questions and challenges were nearly all about presumably male "crushes", presenting heterosexual romance as the only option for pubescent girls. The worst part about this game, though, was that the object was to collect fortune cards, each representing what the game implicitly dubbed the four most important ares of girls' futures: Career, Marriage, Children, and Special Moments. And I may not be remembering this correctly, but I'm pretty sure they were specifically presented in that order -- as if careers are only the time-killers while women wait for their real purpose in life: marriage and motherhood. And my friends and I ate it up. Everyone knew that the career cards were the most boring, and we anticipated reading the cards that told us what type of weddings we might have, what our husbands would be like, and how many kids we would have and what we would name them. In later years, they developed another version of this game that came with a beeping plastic cell phone, and currently, there's a Hannah Montana version on the market. I don't know if the content of these games is any more progressive, but I think the general message -- that girls (and girls only) like to bond with their friends through telling secrets and dreaming about their futures -- is still intact. What is troublesome is how these board may limit girls' futures by painting such a narrow picture of what is truly possible. You should do one about that shopping game, where you shopped at a mall. I forget what the point of the game was. Yay consumerism! I know! I thought of that game, which I think was called "Mall Madness", but I never had it as a kid, and I don't think I even ever had the chance to play it at a friend's house or anything. I definitely remember the commercials, though. I also remember that the mall had a speaker that told the players things. I regret to say that I had both Girl Talk and Mall Madness. I remember few successful games with my friends, though. Maybe I hung with a shier group, and I know I was pretty reserved, but I remember wanting these games because I wanted to be a girl that would play them with relish. That never quite worked out for me, but the memory of them is strong--now that you mention them. This is a great series, Tracey. I hope you continue it! OMG, we HAVE to get the new version of this for the next time I'm home. I also really enjoyed this game called Prom Date as a kid, which I think was my aunt's from the 60s. It was all about nabbing the supposedly hot guy, even though I always thought the supposedly nerdy one was the best-looking. I'm really curious about how you would go about nabbing a hot guy as part of a board game. And of course you were more attracted to the nerd. I'm sure if we had played it back in high school, I would have tried to nab the one who looked like this. Do you think any of them wore arm cuffs?